← Today’s brilliance, By Milton Friedman; also, Ricky Martin is Gay… DUH. Update: Sox Offer Beckett Four More Years. According to Buster Olney and his “sources,” the Red Sox have offered Josh Beckett a four year contract extension worth somewhere in the area of $65 and $70 million. Though this may not be the final deal, there is optimism that this will get done in the next few weeks. Somebody or other might have written that last night’s start, in which Beckett went six innings giving up two runs (also known as a quality start), was an important one towards proving to this organization that he was going to be the ace that they were paying for. 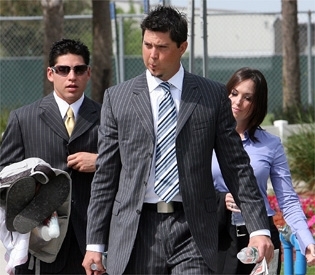 The signing, whenever it gets done, will be a big step towards the future of the organization as Theo can turn his attentions to signing Victor Martinez, trading for Adrian Gonzalez, or finalizing the deal with Sony for the new and improved Dice-K pitching robot that we were supposed to get in 2007. Coincidentally, Casey Kelly is taking the mound at 1:00 today against the Rays. It might be a nice time to showcase the kid if he is not needed to replace Beckett after this year. just a thought. And if you hadn’t heard, you have now been vindicated for all the “Ricky Martin is Gay” jokes you have ever made. All those girls who got mad at me for it in middle school should retroactively feel bad.